Leading organizations are working to build Enterprise Change Management capabilities to support their organizational agility and increase overall project success rate. One of the steps taken to build this capability is the creation of a structure to support change management in the organization, usually in the form of a Change Management Office (CMO), Center of Excellence (CoE), Community of Practice (CoP) or some other entity dedicated to change management. This “organizational footprint” for change management can look different from organization to organization, varying in terms of size, location, composition and role. However, data and experience show that a functional group focused on change management provides value on the enterprise journey of building change management maturity. In function, the group increases effectiveness and efficiency of change management by providing commonality and a single go-to point. The group also provides value and creates credibility for the change management capability journey by demonstrating the commitment senior leaders have made in establishing this center. Research insight: Prosci’s 2017 study participants identified the establishment of CMOs as the number two trend expected in the discipline of change management in the coming years. This article provides a primer on the Change Management Office or functional group, exploring the latest benchmarking data available examining three crucial questions for practitioners and leaders looking to formulate and galvanize a change management structure in their organization. In 2017, Prosci conducted its 10th benchmarking study in the past 20 years on best practices in change management. The resulting research report serves as the de facto body of knowledge on change management and an almanac on change management trends and practices. Since 2013, Prosci has asked questions about the establishment of CMOs and functional groups dedicated to change management. Below is a quick synopsis of the current state of the CMO/functional group. 2017 participants reported a slight increase in CMOs/functional groups dedicated to change management, with 40% of respondents reporting that their organizations had established one. Larger organizations were more likely to have a CMO/functional group. 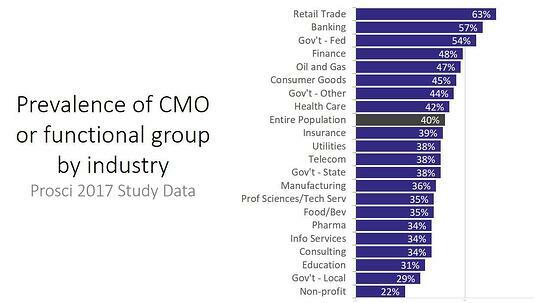 The five industries with the highest levels of a CMO or functional group were: Retail Trade, Banking, Federal Government, Finance and Oil & Gas. As expected, organizations with higher levels of change management maturity were more likely to have a CMO/functional group than those with lower maturity levels. Most CMOs or change management functional groups were not all that big. Nearly half of the study participants reported CMOs/functional groups of between two and five employees. Only one-fifth of respondents reported functional groups larger than ten employees. CMOs tend to be a small group of subject matter experts that support change management rather than a full bench of change practitioners, according to the research. A title using one of the following words related to change: transition, improvement, strategy, transformation, execution or excellence. 1. What Should it Do? What are the actual roles and responsibilities of the CMO? 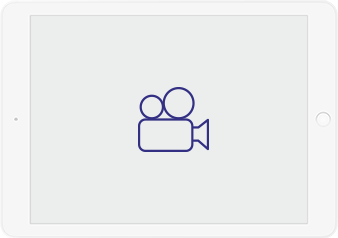 What is in scope and what is out of scope for the group? Too often, these questions are not answered. Everyone begins marching forward assuming they are all on the same page, when in reality they are far from it. Below are the results from Prosci’s 2017 benchmarking study on the roles of the CMO. There is no single right answer for the roles and responsibilities of a CMO or functional group. Each industry, organization, functional group and set of practitioners is unique, so it makes sense that each CMO or functional group will be unique in the contribution it makes to the organization. The key is ensuring that the roles and responsibilities are clearly defined and socialized. A sort of “charter” document for the CMO or functional group is a valuable asset for clearly articulating roles and responsibilities. 2. How Should it Look? To centralize, or not to centralize, that is the question. The design of the functional group matters. Some CMOs and functional groups are very centralized, others are completely decentralized, and still others fall on a hybrid spectrum somewhere in between. As with roles and responsibilities, there is no singular right answer. Whether you should centralize or decentralize depends; it depends on the culture of the organization, the geographic distribution of the organization, the need for standardization/flexibility, and the current variation in maturity. It also depends on where sponsorship and change management application resources reside. There is no right answer, but there are better and worse CMO designs given your organization and the change management capability journey you are on. 3. Where Should it Live? One of the most common and frequent questions is where should the CMO/functional group reside within the organization. While it is the most common question, it is presented last here because the previous two questions – roles/responsibilities and centralized/decentralized – should ultimately inform the decision on the location of the CMO. Prosci’s 2017 benchmarking study collected data on both the current location of the CMO or functional group and the preferred location. 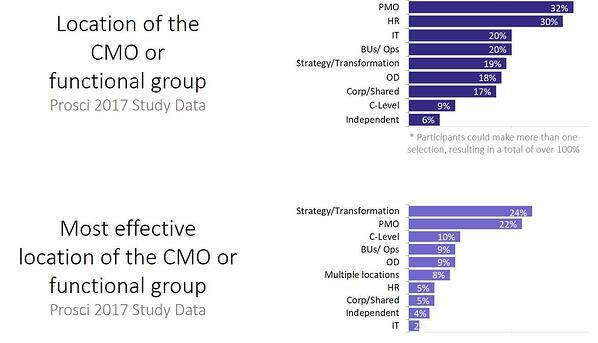 The most common locations for the CMO were the PMO and HR, while the most effective locations recommended by study participants were Strategy/Transformation or the PMO. As with the previous two questions, there is no singular right answer for where the CMO belongs. It has been incredibly successful in a PMO; it has been a complete failure in a PMO. It has been incredibly successful in HR; it has been a complete failure in HR. While there is not a universal “best” location, there are better or worse locations for your organization. The decision criteria presented below have emerged from Prosci research and experience coaching organizations along their change capability journey. Each factor may be a pro (+), neutral (O) or a con (-) for the various locations you are evaluating. The winners of the future will be those who can out-change the competition while staying aligned with customer demands. Organizational agility will be key, and a developed change management capability is central to increasing agility. The establishment of a CMO or functional group serves to increase change management application, maturity and credibility. CMOs come in all shapes and sizes, but three key questions will help you develop yours most effectively: What should it do? How should it look? Where should it live? Change Management Offices (CMOs) come in all shapes and sizes and there is no definitive guide for how one should be structured. This webinar will help you find the answer to building your optimal CMO.